The summer that I was 20 I lived at the beach. With the exception of some underage drinking and a single encounter with Ocean City’s finest law enforcement officers, it was a pretty unremarkable summer. To be honest, working three jobs left me little time to get into much trouble at all. Or to develop a decent tan. But knowing what we do about sun exposure and skin cancer, maybe that wasn’t such a bad thing after all. It pains me to realize that my beach summer was twenty years ago. Instead of mourning my long lost youth, I can use a little kitchen magic to recapture one of my favorite food memories of the summer of 1991…pate de fruit. One of my three jobs that summer was in a candy shop. The same place that gave birth to my abhorrence to fudge also allowed me to develop a love for orange slices. I probably “sampled” more of those than I actually sold. Even though the statute of limitations is probably long expired on that transgression, let’s just keep this confession between you and me. The orange slices won me over at the very first bite. The crunchy sugar exterior gave way to a pleasantly chewy, fruity inside. It was like Sour Patch Kids, only a million times better. And without the scrunchy sour face. I hadn’t had an orange slice since that summer but over the years I had run across recipes for diy versions. I would look at them dreamily recalling what it felt like to be 20 years old and carefree. And then I would turn the page, feeling just a wee bit sad. It wasn’t until my Big Summer Potluck pal Tracy posted a recipe for rhubarb pate de fruit that I decided to just get over myself and try making them. No, they would not turn back the hands of time. And that’s ok. I don’t want to get stuck living in the past. Orange slices may have been me at 20. Rhubarb Pate de Fruit is me at 40. BAH Note: Before I set out to make these beauties, I emailed Sugarcrafter to see if she had any additional guidance to offer on the recipe. Her only comment to me was to watch the temperature as the mixture cooks. So don’t get distracted with Angry Birds, email, or wrangling a wayward child and walk away from the stove. And don’t forget that boiling sugar juice is HOT STUFF that will inflict pain and suffering to those who do not heed its power….so yeah, this isn’t really a child friendly recipe for those of you following along at home. PS, you’ll also need either a candy thermometer or an instant read thermometer that you can clip on the side of your pot. Line an 8 inch square baking dish with a parchment paper sling (two pieces of parchment, folded to fit, laid across each other in the pan). Blitz 1/2 pound of rhubarb in a food processor until completely pureed. Strain the juices through a fine mesh sieve, using a spoon to push the juice out of the pulp. Measure out 3/4 cup of rhubarb juice and discard the pulp. If you don’t get enough juice, repeat the process with the remaining 1/4 pound of rhubarb. Heat the rhubarb juice, lemon juice, and 1/2 cup of sugar in a large sauce pan over medium heat until it reaches 113 degrees, stirring occasionally. Once it reaches 113 degrees, add the remaining sugar, stir and continue to cook until the mixture reaches 238 degrees. At 238 degrees, add the liquid pectin and boil for another 2 minutes, stirring constantly. Carefully pour the hot sugar mixture into the prepared baking pan. Sprinkle the top lightly with sugar and let the pan cool for two hours or until the pate de fruit is completely set. When cool and set, use the parchment sling to lift the candy out of the baking dish. Place the candy, still on the parchment sheets on a cutting board. 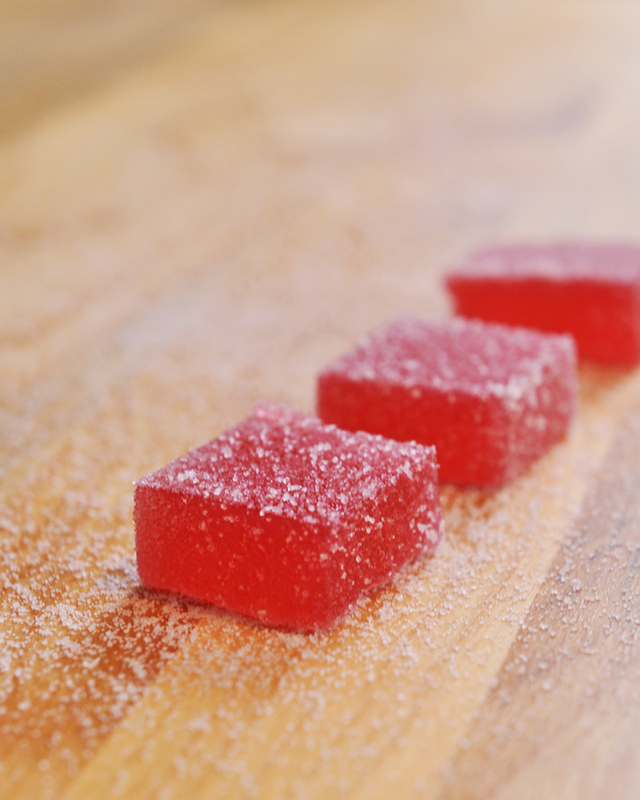 Use a sharp knife to cut the candy into bite sized pieces, cleaning the blade in hot water between cuts. Roll the pieces in sugar until they are well coated and store in an airtight container. I met Jen Schall last year at Big Summer Potluck. And then we both found ourselves attending the IFBC conference a month or so later. One thing led to another and before I knew it we were tweeting back and forth and leaving comments on each other’s blogs. Let me tell you something about Jen, she creates amazing things in the kitchen. Go. Look. Here’s the link. Her talent isn’t limited to the sweets and savories. That’s only half the story. Her pictures are sublime. Knowing that she’s only about 90 minutes away from B’more, I’m tempted to show up on her doorstep one day and request a private tutorial in how she sets up these shots. I had asked Jen after IFBC if she had a recipe that I could include in my Food Memories Project. She said she thought she did and then life got busy in the way it often does. Later we were chatting about my challenges making bread and she mentioned that she had this great dinner roll recipe that she was going to post in her bread baking series. So imagine my surprise when I read her post about her grandmother’s dinner rolls. It was as though I had hit the trifecta….grandmother story (and I’m a big sucker for those), food memory, and a flawless roll all in one. Thanks to Jen and her generosity, I now have perfect dinner rolls in my freezer and a food memory to share with you. The following appeared on My Kitchen Addiction on 3 May 2011. If you ask anyone in my family, they will tell you that these are the ultimate dinner rolls. But, I can’t really take credit for them. 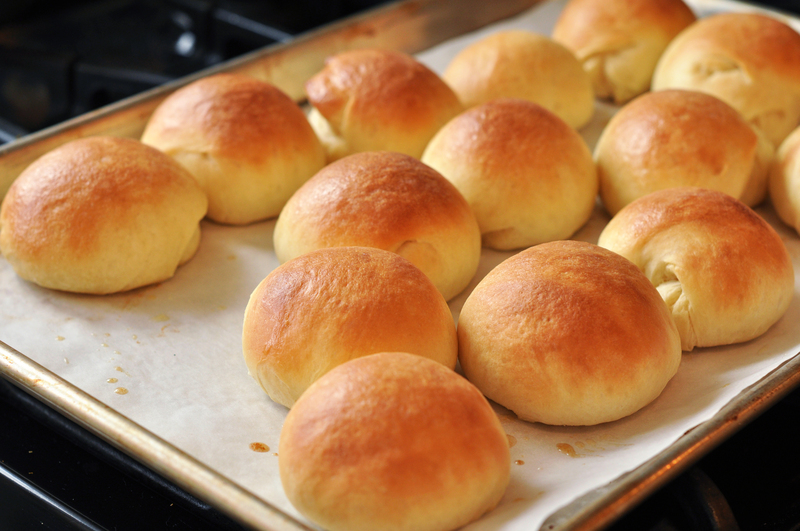 These are my grandmother’s famous rolls… Whenever we would have get togethers with the whole family, she would make a big batch of these rolls. They were a holiday staple for years. My brother and cousins would fight over them, and I’m pretty sure that there were times where they each had more than 10 rolls in one meal. They really are that good. My grandmother was a great cook and baker. Though she passed away a few years ago, I often think of her when I am in my kitchen. I am fortunate enough to have many of her recipes, and though I can’t prepare them quite the way she did, they always remind me of her. Until recently, the recipe for her rolls was one of the few recipes that I didn’t have. In December, my mom and I were putting together a book of family recipes for my brother and his new wife. When we asked around for recipes, one of my cousins happened to have the recipe for the rolls. We put it in the book (especially since my brother was one of the biggest fans of the rolls), and I set out to learn to make them myself. Perhaps my grandmother is looking down on me, because there’s just something about these rolls that always amazes me. They really are quite simple to make, and they always turn out beautifully. They are the lightest, softest dinner rolls I have ever made. They’re also pretty adaptable. I have swapped out the all purpose flour for whole wheat, added flax, used oil in place of the butter, and even made them with herbs and cheese. The rolls also make fantastic buns for hot dogs and hamburgers… You’ll want to keep the recipe on hand this summer! BAH Note: I’ve made these as cloverleaf rolls with success. After the second rise, portion the dough into 18 rolls. Divide each roll into three equal pieces and roll them into three small balls. Place the group of three dough balls in the buttered cavity of a muffin tin so that it looks like a pyramid. Brush the tops with melted butter, cover loosely with plastic wrap, and let the dough rise just until it reaches the top of the muffin tin. Bake at 400 degrees for about 10 minutes. I’ve also frozen the cooked rolls and let them thaw at room temperature or warmed them in a 350 degree oven. Add the butter and egg. Stir to incorporate and break up the egg. Add 1 cup of flour and beat vigorously to fully incorporate the flour and any lumps of butter that may have been remaining. Preheat the oven to 425°F. Shape the rolls and place them on a baking sheet lined with parchment paper or a silicon liner. Let the rolls rise while the oven preheats, until they are a bit puffy. If desired, brush the tops of the rolls with some egg wash (to make them shiny) and sprinkle with sesame seeds (I usually do this for the hot dog and hamburger buns). Bake for about 12 – 14 minutes, until the rolls are golden on top. My friends and family often joke that no one turns down an invitation to our house because they want to come and eat the food, lol!! Cooking is amazing to me, combine a bit of this with a bit of that and look what you get…a party in your mouth! I enjoy cooking for my family, cooking for others, planning party menu’s and I LOVE cooking with my children. From an early age, the kitchen became my happy place. One day, I had a flash of a memory…it was about first time I remember cooking as a kid, I could see myself walking toward my family, who were all sitting at the table looking at what I had made with anticipation and excitement. I can remember exactly how I felt carrying that cake as I walked toward them. I though well…THAT one moment was certainly a defining moment for me…and you know what I don’t even have a picture of it…WHY I thought don’t kids cookbooks have a way to capture some photos of what they cook up in the kitchen, who the cook with…after all to many of us some of our most precious memories happened in a kitchen at the knee of someone we love/loved. So, I sat down and outlined the book and began to write it, then formed a group about a year later with 3 other mom’s and produced the book. I have even been on QVC with it – all that from a memory. See what I mean about the talented people I had the fortune to meet that day? Colleen took a memory and turned it into a book. She’s been on QVC y’all. I knew about the book but not the QVC…she must have nerves of steel. I’m going to have to ask her all about that experience when I see her this summer at Big Summer Potluck II. Until then, we can all enjoy her Snickerdoodles Food Memory. For me, eating certain foods and hearing certain songs are the most powerful drivers of my memories. The food memories, for whatever reason are all warm and happy…the music ones take me back to so many different events, some crazy happy some achingly painful and some “what was I thinking”! Anyone with me on this? I can see in my minds eye my Grammy often making Snickerdoodles, I can see me helping her, sometimes alone, sometimes surrounded by my cousins and siblings. I can’t recall a Christmas at her house without having eaten as many of them as I possibly could without any adults saying a word! Man, holidays are best!! But do I have HER recipe…nope. I do make Snicherdoodles often as my children love both baking them up and of course eating them up. 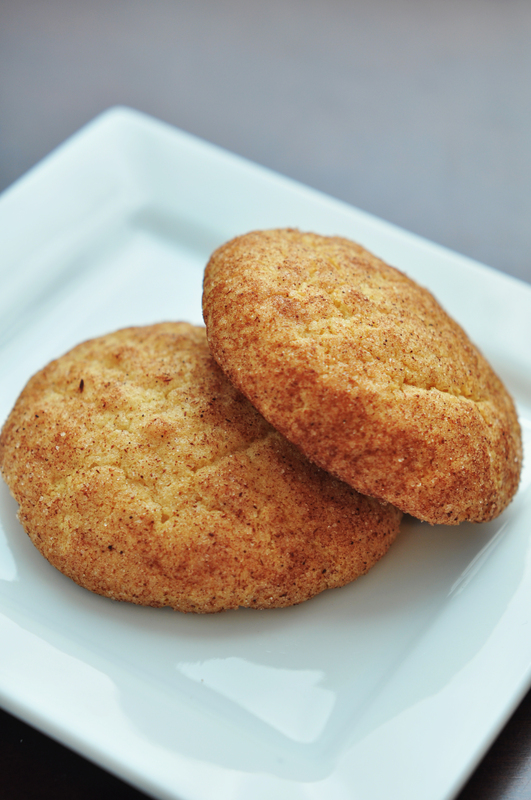 I was intrigued when I saw this recipe for Snickerdoodles from Miss in the Kitchen (a really nice gal who cooks up quick family style dishes). One of the ingredients in her recipe is cream cheese….yes…cream cheese. Never heard of such a thing in a Snickerdoodle, so I wanted to find out how that would change things. These were good…they were softer than what I am accustomed to and did not last long in my house lol! We even made 1 HUGE cookie that could have fed 4 kids easily, however my two knuckleheads decided to split it to see if they could eat it! My 9 year old son polished off his half…while my 6 year old daughter made a valiant effort! BAH Note: The only thing I will add is that the cookie dough is very soft. I refrigerated mine for about 30 minutes before I tried to scoop it. And then I returned the bowl of dough to the fridge after I had scooped enough for a sheet pan. Preheat oven to 375 degrees. In your mixing bowl, add cream cheese and butter. Beat with an electric mixer until well combined. Beat in sugar, eggs and vanilla . Add flour and baking soda mixing until all combined. Scoop into 1 1/2 inch balls and roll in sugar and cinnamon mixture. Place 2 inches apart on a greased or lined baking sheet and press gently with tines of a fork in a crisscross pattern. Bake for 10 to 12 minutes. Remove to a wire rack to cool. Today’s Food Memory comes from fellow Big Summer Potluck attendee Jennifer of Bread and Putter. I had no way of knowing at the time that Jennifer and I would become bff’s on Twitter (@breadandputter). Don’t tell The Mistah but I think she knows more about me via my twittering than he does after 6 years of marriage. Is that bad? My early cooking adventures were kind of pathetic. I once cooked a hot dog in a frying pan that was burned on the outside and still frozen in the middle. I could always bake – I can follow instructions pretty darn well, but cooking always seemed a little more loosey-goosey. There are things about cooking apparently you are just supposed to know instinctively or something, and I didn’t. Yeah, I can totally understand that. Maybe she and I are kindred kitchen spirits. I really love cheese and bacon. I hate coffee, Swiss chard, Brussels sprouts, beets and anything that leaves orange cheese powder on my fingertips. Dark chocolate is the best chocolate but milk chocolate is good too if there’s peanut butter in it. There’s nothing quite like hot crusty bread fresh out of the oven with some good butter on it. I’m going to pretend that she didn’t include coffee, brussel sprouts, beets, and cheetos on her list of dont’s. For our second date, my now husband invited me to his house for dinner. I didn’t know what to expect. I arrived with a bottle of wine in hand but he didn’t have any wine glasses. So, we drank it out of regular glasses but in retrospect, who was I to judge? It was white zinfandel. 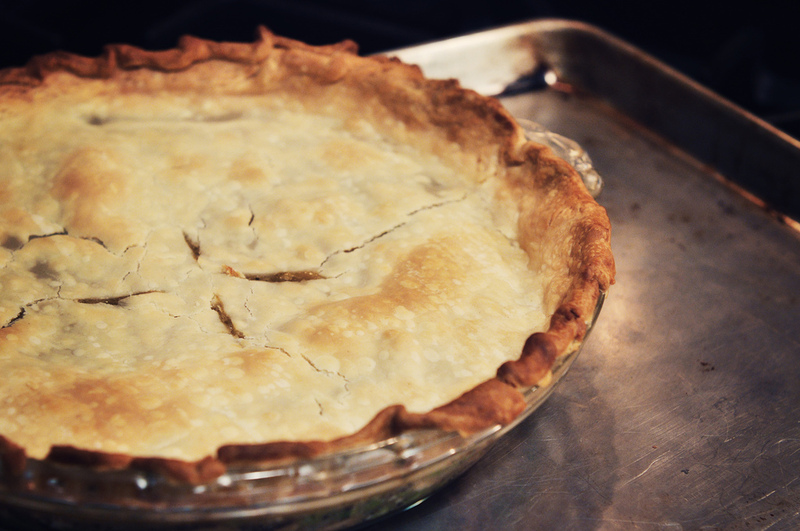 When it was time for dinner, I was impressed when his creation came out of the oven – a homemade chicken pot pie! This guy was racking up points fast! For our first date, he had invited me to a play. Classy, right? And then he bakes up a pie for me. What wasn’t to like? When he cut open the pie and served me a slice, my excitement waned a bit. In addition to the chicken and gravy, there was a lot of broccoli in the pie. At the time, I really was not a broccoli fan. And all I could taste in that pie was broccoli. But, I was gracious and I ate up my whole serving and I complimented him on that pie. I would later learn that the pie dough was from a box and the gravy was from a can, but I still give him lots of credit for that pie. There was still a lot of measuring, preparation and assembly involved. As the years passed and I confessed my non-love of broccoli, the pie took on other incarnations with carrots and peas replacing the wretched broccoli. And then a funny thing happened. He was a single father and was doing his best to put food on the table for his two daughters and trying to set a good example. So, in turn, when I was dining with them, I tried to set a good example and not be fussy and eat what I was served. And over time, my palate grew in an unexpected way. I learned to like, if not tolerate, just about everything. Including broccoli! These days we even grow broccoli, in our garden at our home together. Here is his original chicken pot pie recipe. These days I usually make my own crust and my own gravy if I am making it, but I promise, it is still pretty darn good with the boxes and the cans. And if you make it for someone else with love, isn’t that what really counts? B&P Note: I’ve transcribed this exactly as written. It amuses me. Boil veggies till soft (nothing falling apart.) Strain. 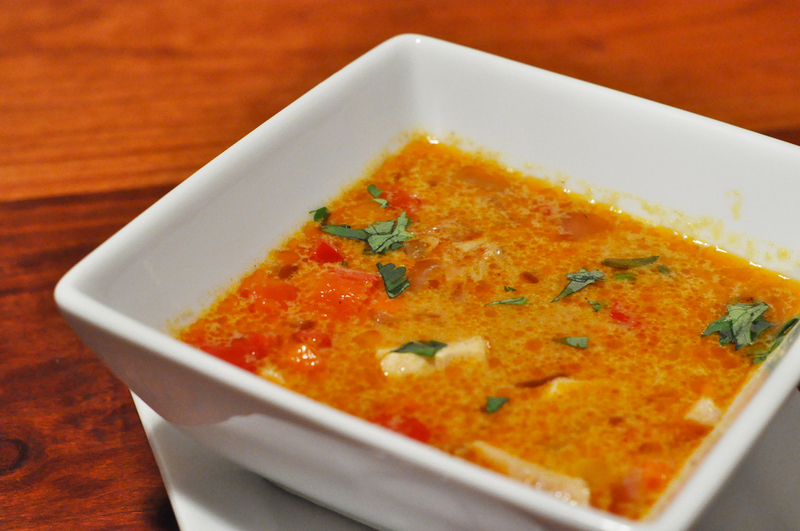 Open 2 cans Franco-American chicken gravy – cook till hot. While cooking gravy, prepare two pie shells in pans. Throw in chicken & veggies into hot gravy. Mix. Fill pies. Cover pies with remaining pie crusts. Baste with butter. Slit pie crust tops to vent heat before putting in oven. Cook covered in preheated 425 degree oven 20 mins. Remove foil cover & cook 25 mins more. Remove & let sit a minute before cutting. Heat oven to temperature called for on the back of the box of pie crust. Combine gravy and cornstarch in a medium saucepan set over medium heat. Bring to a boil, stirring occasionally, until the gravy has thickened. Add the peas, carrots, and chicken and stir to combine. Transfer the filling to a 9 inch pie plate. Top with the pie crust, crimping the edges as you go. Cut four small slits in the top of the dough for steam to escape. Place on a sheet pan and bake until the filling is bubbly and the top has browned. If the edges of the crust are browning too fast, cover them with a ring of aluminum foil. Today’s Food Memory comes from Jenny Yu of Use Real Butter. URB was one of the very first blogs I started reading when I jumped onto these here interwebs, back when I could manage the blogs I read in my browser’s Bookmarks. While the bookmarks have been replaced by Google Reader, one thing that hasn’t changed is my admiration for Jenny. She cooks. She writes. She takes stunning photos. And she has a spirit that inspires. I had the opportunity to meet Jenny last summer at a food blog conference. It was a thrill to finally be able to meet her in person after being a fan of her blog for so long. Successful, yet approachable, gracious and encouraging, I consider Jenny to be one of the leaders of this crazy tribe to which I belong. She understands the power of food and community. When I read her Puffy Hearts post last month, I knew it was a story that I wanted to include in the Food Memories series. But what would Jenny say? I’ve had people say no before but the only way anyone ever says yes is if I get over my fear of rejection and ask. So I did, thinking that it would make a perfect post for Valentine’s Day. And I was elated when she said yes. Evidently, this was the post that The Universe wanted me to share with you on this day of love. My thanks to Jenny for allowing me to share with you her memory of snow days, special pastries, and Shaun Cassidy. Puffy Hearts and Rings appeared on Use Real Butter on 10 January 2011. While I’ve done my best to capture the beauty of the Puffy Heart that came out of my kitchen, you really need to click that link and see them through Jenny’s lens. When I was a little kid growing up in Virginia, snow storms would catch me by surprise. The only way I knew anything was in the works was when Kris would stay up late tuning the radio to find out if school would be closed the next day. On those very rare snow days we would stay home playing games, running around the house like maniacs jumping off the stairs, building forts, watching television, lip syncing Shaun Cassidy while standing on top of the coffee table, and sledding down our steep driveway. I have a lot of good memories of Kris. Living in Colorado, we can get snow as early as September and as late as May. It snows in our mountains in June and July too. Even though it is a common occurrence I still get excited – I just don’t lip sync Shaun Cassidy from the coffee table anymore (I have that very coffee table in our great room). These days I suit up and head out. After we return from a ski – be it at a resort or in the backcountry – it’s Kaweah’s turn to play in the snow. When she was a wee pup in Ithaca, New York, we’d take her out into the snow and find the deepest drift to drop her in. She’d expend an enormous amount of energy bounding about in the snow and would sleep all night long at home. Yay! Now in her golden years, Kaweah doesn’t wander as far into the snow nor does she handle the cold as well as she did in her crazy years (years 0-10). She sleeps much of the day and all of the night. As a kid, I never remembered being cold when I played in the snow. Maybe that’s because as kids, we’re crazy people? I would barely recognize myself today, grabbing a warm hat, gloves, boots, jacket, sunnies, chapstick, sunblock… While thinking back on those snow days of my youth, I grew nostalgic for my mom’s baking projects. She wasn’t much of a baker, but she did have a handful of sweets she could make for potlucks and parties. What I loved most were these things called puffy hearts and rings. Have any of you heard of puffy hearts and rings? I just knew it was an involved process for my mom because I’d watch her patiently shape the dough into hearts and rings with two spoons as I bounced up and down singing “puffy hearts and rings!” in anticipation of my favorite treat. It was a super sticky dough and she only made them once or twice a year – usually around the holidays. I can close my eyes and recall the properties of that dough. I knew the taste and texture of the baked pastry, the icing, the almonds. The flavor was almonds. I am a complete sucker for almonds. One morning I woke up and said to myself, “It’s cream puff dough.” I pieced together what the puffy hearts and rings were from memory and set about recreating them. Cream puff dough would most certainly be a sticky mess to shape into hearts and rings. I opted to pipe the dough into the desired shapes. Then there was the icing: confectioner’s sugar and milk or cream. Since I’m lactose intolerant, I used water instead. The flavor was most certainly almond extract. Then a little coloring – they were always pink hearts and green rings. When the puffs were done baking and cooling, I iced each one and sprinkled slivered toasted almonds over the icing while it was still wet to make sure the almonds adhered. I bit into one. This is what I remembered – almond flavor, sweetness, the egginess of the soft dough. I liked it. I had Jeremy try one just to be sure that it wasn’t just me and my nostalgia that thought it tasted good. We have another fan and I have happily brought an old memory back to life. BAH Note: I scaled Jenny’s recipe down by half because I thought 2 dozen puffy hearts might be a little much to handle. In hindsight, I wish I would have made more. The puffs are tender and light while the frosting is the perfect balance of sugar and almond. I got six very large hearts out of the dough and The Mistah and I polished them away in just a few hours. While Jenny’s recipe has you mixing by hand, I entrusted the dough to my stand mixer. You do what makes the most sense for you. BAH Tip: If you’re artistically challenged, like I am, trace the outline of hearts in pencil on your parchment. Then flip the parchment over and pipe the dough into the outlines. 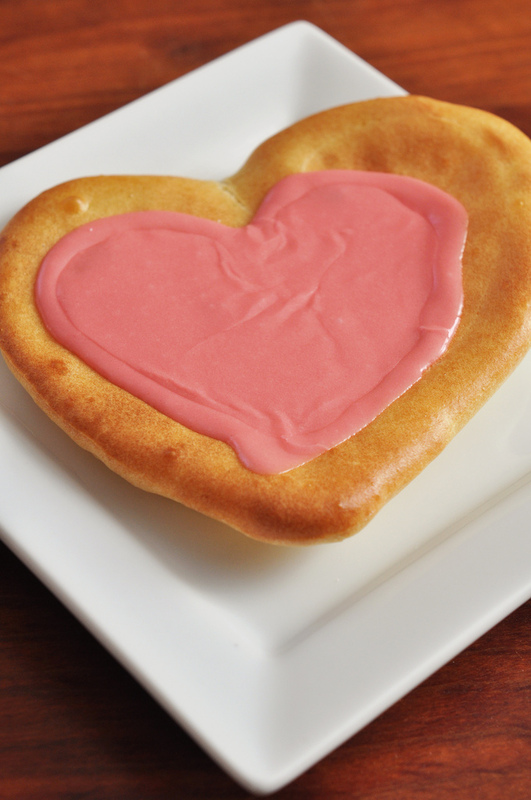 When I went to decorate the hearts, instead of dipping them into the glaze, I filled a small sandwich bag with my frosting, cut one corner off and then piped away. I started with an outline, let that set up for a few minutes, then went back and filled it in using a toothpick to carefully drag the frosting so that the entire outline was filled. Line baking sheets with parchment paper. Heat oven to 400°F. Heat one cup of water and the butter in a medium saucepan over high heat until butter is melted and the liquid is boiling. Remove the pan from heat and add the flour all at once. Stir until the dough forms a ball. Add eggs one at a time, stirring vigorously after each addition until the egg is completely incorporated and the dough is smooth and satiny. Scoop the dough into a piping bag with a medium plain tip (about 1/2 inch in diameter). Pipe rings and hearts on the parchment with enough room for expansion (2 inches of space in between). Bake for about 20 minutes or until the tops are golden in color. Remove from baking sheets and let cool completely on cooling racks. Mix the powdered sugar, 3 tablespoons of liquid, and almond extract in a medium bowl. Add food coloring as desired. I split mine in two batches and color one pink and the other light green. When the puffs are cooled, dip them face-down into the icing or drizzle them with icing. While the icing is still wet (it dries very quickly here) sprinkle almond slivers over the icing and gently press them into the icing. Makes about 2 dozen (depends on how big your puffs are).